So Sibyl actually decided to change itself and purge the criminal minds from within the system. It’s not a totally unexpected outcome, but it’s interesting that the system decided to evolve. I do agree with what the representative was saying about the dangers of judging collectively, though. I can see an scenario where a brainwashed group is considered to be highly criminal and deserving of death when most of the members probably only need to be paralyzed. Psycho Pass 2 Episode 10: She finally knows? I’m not too sure what to make of this week’s episode. Most of it seemed to be the explanation of why Kamui needed to be killed…the whole thing about allowing Sibyl to judge a collection of people made it vulnerable to itself. But that bit didn’t exactly feel like it needed an explanation to me. I mean, they established last week that Kamui wanted to judge Sibyl, right? Since they went through the trouble of creating a cliffhanger for Togane at the end of this week’s episode, I’m assuming the first shot from Kamui doesn’t kill him. Either way, next week’s the last episode, so we’ll finally get to see if Akane can reform the Sibyl System from within. I assume we’re headed towards an ending where Sibyl is still around, after all. Author marthaurionPosted on December 12, 2014 Categories Psycho PassTags dominator, sibyl system1 Comment on Psycho Pass 2 Episode 10: She finally knows? Psycho Pass 2 Episode 9: Final encounter time? It looked like Togane had his Dominator pointed towards Akane when she saw her grandmother’s ear. Did her color change? Even if it were to move slightly, it would be enough of a hint to warrant further investigation. She certainly looked pissed off enough to trigger some sort of change. I suppose this point in the show will really establish just how resilient she is. Well, the end of the episode certainly made it sound like the final fight against Kamui was starting, so I guess it will have to span the last two episodes. Also, the end of the episode suggests that Akane’s relatively calm nature is hereditary, which begs the question of what happened to the rest of her family. 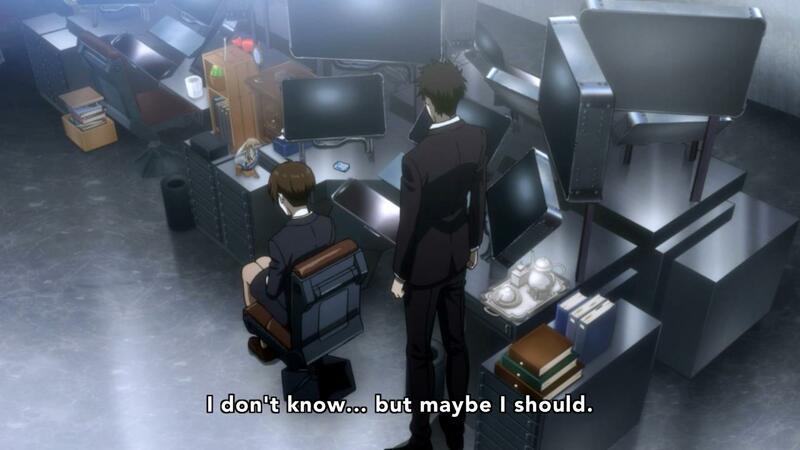 Also, I’m still waiting for Kougami Shinya’s surprise appearance…it’s starting to look very unlikely now, since he would have to show up at the very final second to help. Author marthaurionPosted on December 5, 2014 Categories Psycho PassTags dominator, sibyl systemLeave a comment on Psycho Pass 2 Episode 9: Final encounter time? Well, we finally have an explanation for why Kamui cannot be judged by the Sibyl System. I assume it’s only because of the sheer number of different people’s organs that were implanted in him…otherwise any transplant would clear a person. Or maybe people already have their Psycho Pass altered slightly when they undergo transplants? That’s not too productive of a speculation, though. That aside, it looks like Togane’s obsession for Akane is also somewhat revealed. Apparently, he enjoys messing with Crime Coefficients…it would make sense that he would take interest in Akane, who seem to retain her Crime Coefficient regardless of the situation. It looks like Shimotsuki’s snooping has finally gotten her in trouble with the system. It doesn’t look like she will die for it just yet, though…instead, it sounds like there is a plan to reveal the Sibyl System’s secret to the world. What exactly spurred this on? Is this because Kamui has seemingly broken the system? I’m surprised someone as calculating as Kamui would do something as simple as using only dead passengers from a flight he was on…I guess that’s supposed to mean that he wanted to be found? It would also explain why the doctor is so willing to talk about Kamui. Now I’m just trying to figure out whether that thing the doctor said about Kamui not being alone was meant to be symbolic, saying Kamui has all of these dead passengers as cover and “company”, or meant literally, meaning Kamui has partners using these Holos. Feels like they’re gearing up for a final encounter pretty quickly. There are still at least four episodes left, right? It almost feels like they have too much information for that amount of time. I guess the only remaining grey area is this link that was found to Togane…puppet master? Or some sort of elaborate bait? Author marthaurionPosted on November 21, 2014 Categories Psycho PassTags dominator, sibyl systemLeave a comment on Psycho Pass 2 Episode 7: The enemy is everywhere! 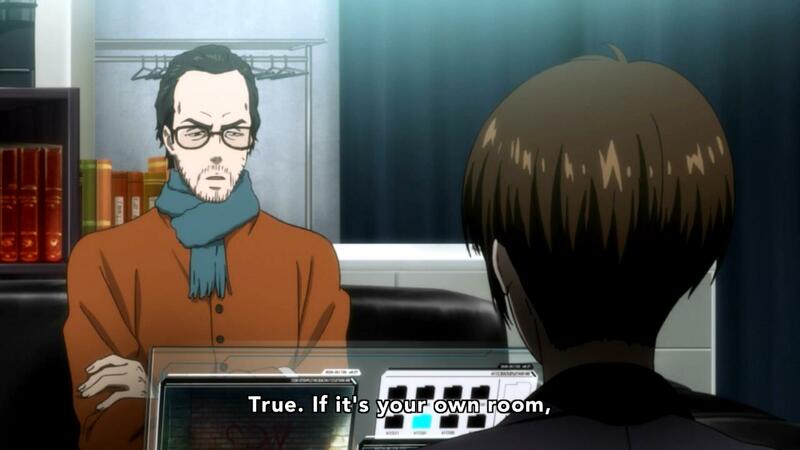 Psycho Pass 2 Episode 6: Why not take the shot? It looks like a pretty drastic approach was taken for handling the drone situation. I guess Sibyl really doesn’t care too much about the violence in video games bit because the colors only start changing after the true details of the drones are revealed to the people playing. Seems almost a bit boring, but it’s not that important to the episode. 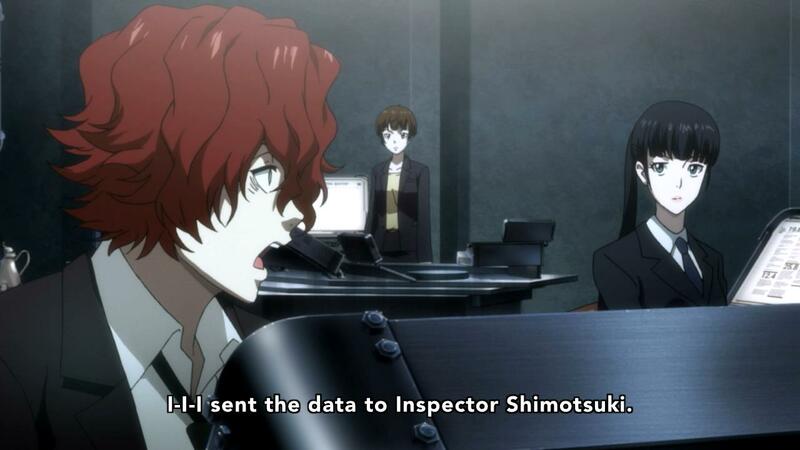 Anyway, it seems like Kamui’s plan was to steal Dominators…but why if only he and the captured Inspector can use them? I suppose it was confirmed this week that Dominators have some sort of restriction on usage, but how relevant is that to Kamui’s plan? Also why did Akane stop Togane from shooting at Kamui? I get that there was a Kougami Shinya flashback moment, but is it as simple as not wanting him to have to go into hiding like Shinya did or is there something more? And does it have anything to do with Togane’s creepy moment after checking Akane’s color? 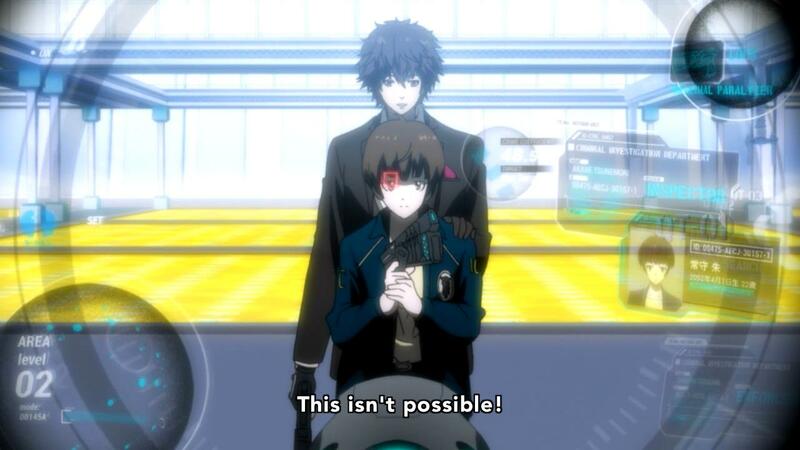 Author marthaurionPosted on November 14, 2014 Categories Psycho PassTags dominator, sibyl system, wcLeave a comment on Psycho Pass 2 Episode 6: Why not take the shot? Oh boy, now we’re using video games to manipulate people into killing other people. Is this trying to bring up the age-old question about violence in video games? If you’re only trying to kill virtual enemies (but in fact killing living beings), are you truly committing an act of murder? I believe many would say no (probably because they play these games themselves), but I can certainly see a large pocket of society answering yes (although I feel the argument on violent video games seems to have waned in society these days). And so Kamui’s true intentions are starting to come out…he wants to judge the Sibyl System. It might make things interesting. Given how much he is shaking up the Dominator system, I really do wonder what the fate of Sibyl will be at the end of this show. I’m assuming the comment that Akane made about the unauthorized Dominator user is explained simply with the eye stolen from the captive Inspector from last week. 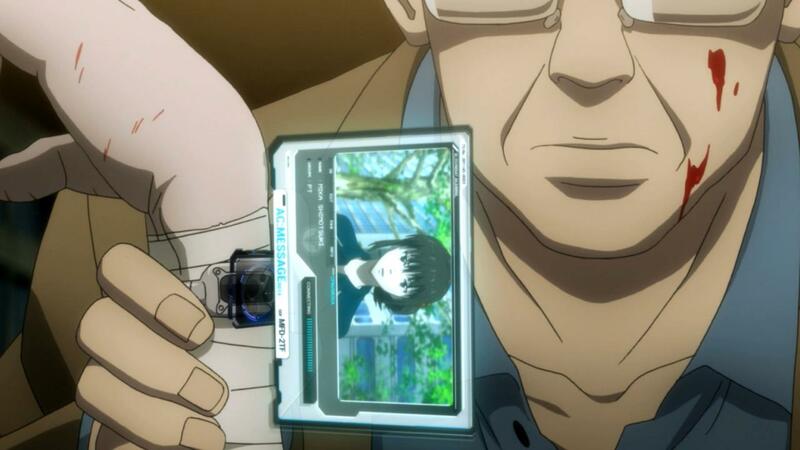 Psycho Pass 2 Episode 3: Kirito is the culprit! Well, we finally get a bit of an introduction from the culprit, Kamui Kirito. I’m curious whether the method to reduce the Crime Coefficient lied in what he was doing in the Inspector’s mouth (either hitting a pressure point or infecting her with something since he bled her) or in what he was saying (something about remembering who you were)…more than likely the former. I’m also curious why he needs the Inspector’s eye…presumably it’s linked to his crazed obsession with finding out his color, but I guess we’ll see. Well, it looks like people are going crazy in the streets and the Dominators are ill-fit to handle the situation. Maybe it’s time for Kougami to make his stunning re-appearance? That’s probably something that would be sure to mess with everyone…still, if he hasn’t really been a factor already, it’s possible he’s being kept aside for a last-minute arrival. Author marthaurionPosted on October 24, 2014 Categories Psycho PassTags dominator, sibyl systemLeave a comment on Psycho Pass 2 Episode 3: Kirito is the culprit! So we finally get a glimpse of the main culprit this week. Is he trying to make some big point or does he actually care about the criminal that was just killed by the police? Well, I guess he’s no Makishima after all. Maybe this season is trying to focus more on the criminals and how the police handles them while Makishima focused more on the Sibyl System. Honestly, that thought is pretty worrying…sounds pretty boring to me. I know we have all of these situations with excessive police violence in the news these days and the Dominators are probably the epitome of excessive force, but it just seems so boring compared to analyzing the implications of the Sibyl System. Anyway, it looks like everything in this season will revolve around some sort of phenomenon (probably a drug) that can lower Psycho Pass scores…could be interesting if they explain the phenomenon well. Let’s see where things go.